Photopea is a free online image editor to edit PSD and XCF files online. So if you have some Photoshop files (PSD) or a GIMP files (XCF) to edit and don’t have these software installed on your PC, feel free to use this online image editor and edit your PSD & XCF files online effortlessly or even create new PSD or XCF files from the scratch. Well not just these two file formats, it supports editing of other file formats such as JPG, PNG, etc as well. It comes with a powerful and smooth editing interface. Its editing interface is pretty similar to Paint.net and Photoshop. So, if you are familiar with these powerful image editors then you will find it quite easy to use Photopea to edit PSD and XCF files. However, it is not as advanced as Photoshop or GIMP but it comes with some handy editing options. It allows you to work with multiple layers, adjust image saturation, brightness, etc, offers tons of effects, and blending modes, etc. If you don’t prefer to use an online image editor then you try these 5 free software to edit PSD files but in these case, you will have to download a software and install it before you can get started to edit PSD files. By using Photopea, you do not need to download any software, and you can start editing your PSD and XCF files in a flash. You can open multiple images on Photopea and edit them side by side in its tabbed interface. This is definitely very useful if you are working on some PC on which you don’t have any photo editing software. During my testing of this free online image editor, it stopped working quite a few times. After that, I had to restart it to edit my PSD file from the scratch. Getting started with this free online image editor to edit PSD and XCF files is really simple. Just visit the link provided at the end of this review, which will directly take you to its editing interface. You don’t have to create an account or login to save/download your edited images. 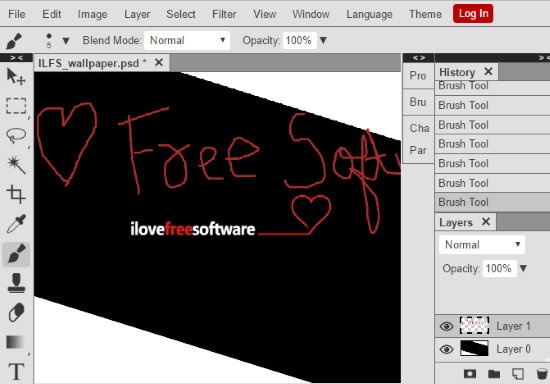 As I mentioned earlier, its editing interface is similar to Paint.net. You’ll see an editing toolbar on the left side, menu bar on its top, History panel and Layer panel on the right side of its interface, and the editing canvas at the center. You can see this in the first screenshot of this review. You can use it just like other desktop image editors; select an option like crop, brush, lasso select from its editing toolbar and then perform that operation on the drawing canvas. Don’t worry if you commit any mistake, it offers unlimited undo and redo to revert changes. It also supports layers for editing images. Apart from that, you can also apply a number of different effects like pixelate, blur, etc and even add noise to an image. The best part is that you can also use it to create a PSD or XCF file or save a JPG, PNG, etc file as a PSD or web file (BMP, PNG, JPG, etc). Open a PSD file by File>>Open or start by creating a new project by File>>New. 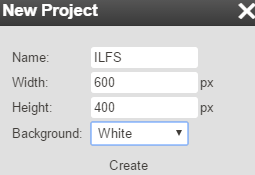 If you choose to create a new project, it will ask you to specify a project name, height and width of the image, and its background type i.e. White or Transparent. As I had a PSD file to edit, so I chose to edit a PSD file by opening it in Photopea. Now, you can start editing PSD or XCF files by using editing options from its editing toolbar. Select an editing tool and then you can use it to edit your PSD image. Move tool: Move the selected pixels. You can copy/cut pixels and move them around on an image or different images opened in Photopea. Rectangle and Ellipse select: Select image pixels in rectangular or ellipse shape. Lasso select: Allows you to select image pixels in a free shape or an irregular shape. Brush tool: You can also draw freehand on the image by selecting Brush tool from its editing interface. 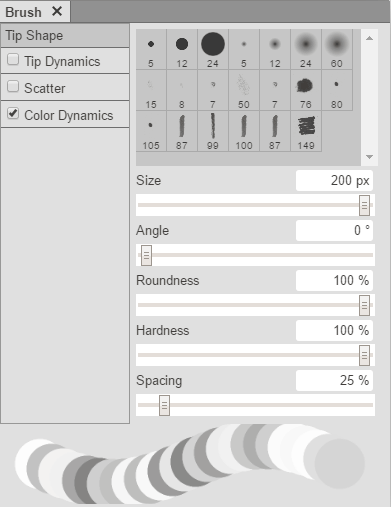 You can further adjust brush thickness, select brush color, etc from brush settings. 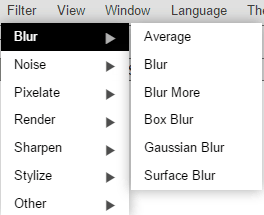 To access brush settings, select Bru option on its interface. It will then pop-up a dialog box from which you can adjust from a number of brush settings like brush tip shape, color, and more advanced settings. Magic Wand: Select pixels by detecting edges, shapes, etc. Crop tool: Allows you to crop an image. Clone tool: Select pixels by detecting pixel color, tone, etc. Text Tool: You can insert text in an image and it offers tons of different fonts for it. To insert a text, select Text Tool from the editing toolbar and then specify font type, size, text alignment on Font toolbar that appears on its interface. After that, simply click on any part of the image where you want to insert text and specify the text. Eraser Tool: Erase image pixels. Zoom tool: Zoom in or out an image. As I mentioned earlier, you can also apply a number of different effects on your images. During my editing, I found an interesting effect that you can use to find edges in an image. The effect name is “Find Edges” that you can find under Filter>>Stylize. This free online PSD editor offers popular effects like gaussian blur, an effect to add noise in an image, and many other. To apply effects on your image, select an effect from Filter menu. 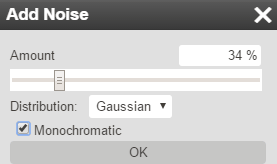 You can add noise to your image by selecting Add Noise option from Noise effect. After that, specify the noise level, you will see the changes in the real time, and at last, click on OK button. In the same manner, you can apply other effects as well. Once you are done editing your image, you can download it as PSD file, or any other supported format. It does not add any watermark to the downloaded file. Photopea is a free online image editor to edit PSD and XCF files. It is a pretty awesome online image editor that offers a number of advanced editing options to edit PSD and XCF files right on the web. If I talk about its performance, it was quite satisfactory, but like I mentioned in the review, it lagged / hanged quite a few times due to unknown reasons. I will definitely recommend this free online image editor as it allows to view and edit Photoshop and Gimp files on the go. Despite being a web application, it can surely beat some good desktop image editors. Start editing PSD and XCF files online using Photopea.